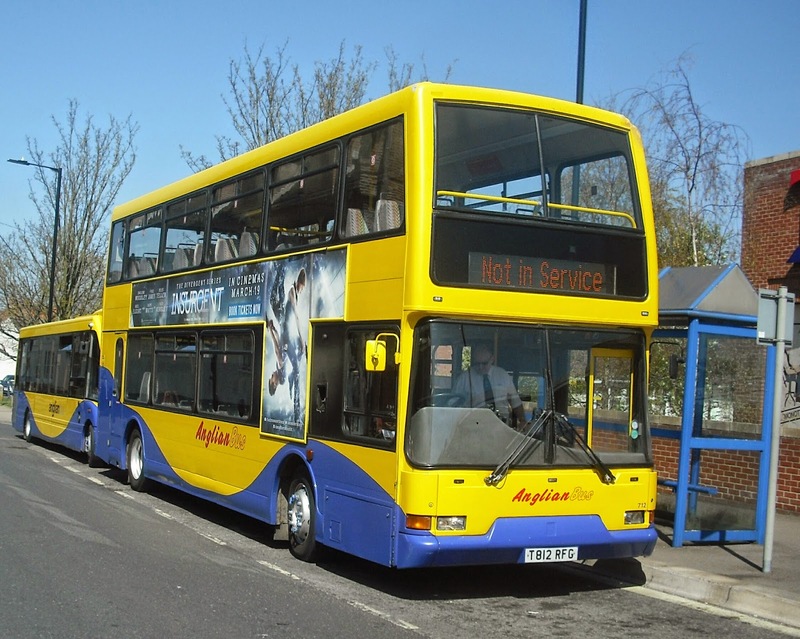 For the first time today all three Anglian ex Metrobus Scanias were on the road. This might not happen very often as it seems they may have more teething troubles than a buck toothed shark, so as I have been first in bringing you pics of all three I thought I'd bring all three together in one post. 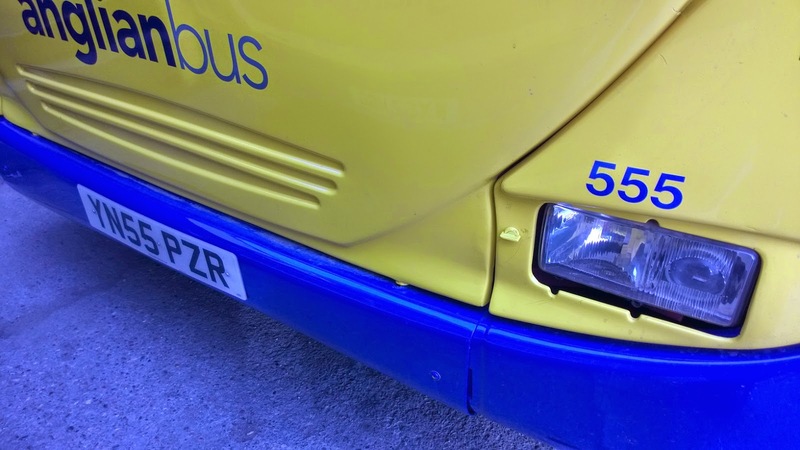 The first arrival was 556, YN55 PZF, which only lasted a couple of days before having to go back down to Hampshire to have things sorted out. She is now back and earning a living again. Friday last week saw the arrival of 554 YN55 PZC. After spending the weekend being prepped, on Monday she was found on the 7/61's. And so today saw the final Omnidekka, 555, YN55 PZR make its Anglian debut on the 88's. I didn't even know she was out in service yet, I was just waiting in Halesworth for the 62 for the final time and she turned up. Nice one, so bagged a pic, worked out her diagram, and caught her back from Norwich later on. They are all comfortable, with better seats than any of the other Scanias, rattles that are no more than you'd expect from a 10yo bus, and look great. I just have this uneasy feeling that they might be plagued by the sort of niggly problems that you always take a gamble with when buying second hand. Time will tell and I hope I'm wrong. 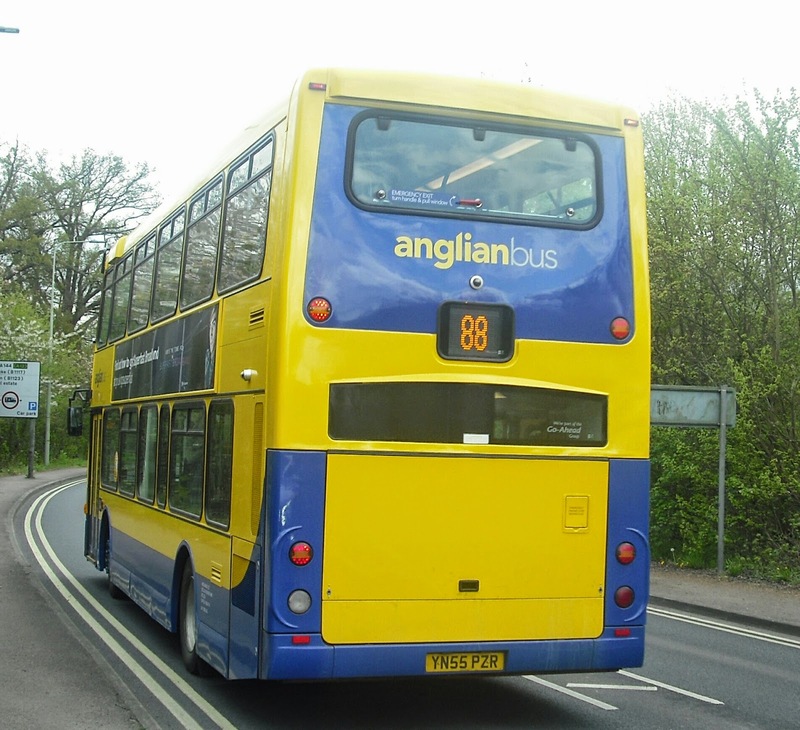 Anglian are dominating the blog at the moment, and that will continue with the last days of several routes this week. There will be a couple of special posts over the weekend and I'll try and get a couple of foreign posts up with contributor's pics too. A quick correction to the Trident transfer to Hedingham. 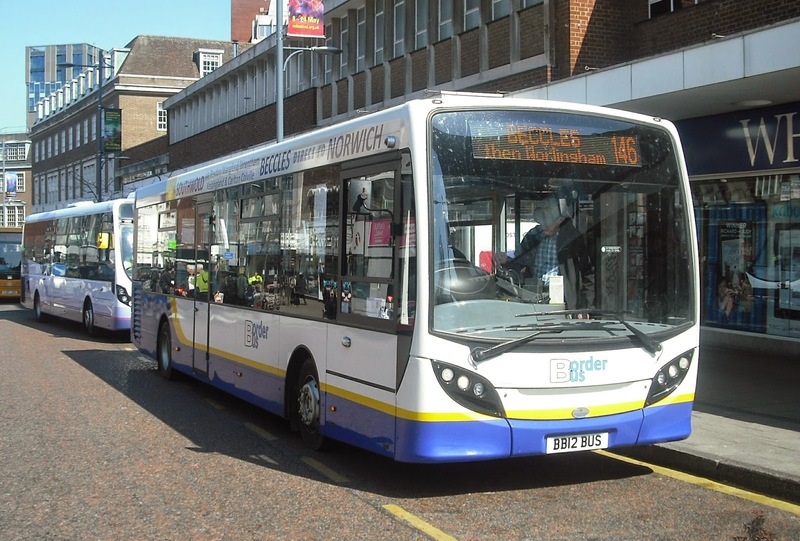 722 departed as planned on Monday, However instead of 725 following it was 712 that made the trip to Essex yesterday. I am reliably informed that 725 will transfer on Monday next week, Tuesday at the latest. So this pic I took of 712 in Beccles last week signals the end of Anglian liveried Tridents. 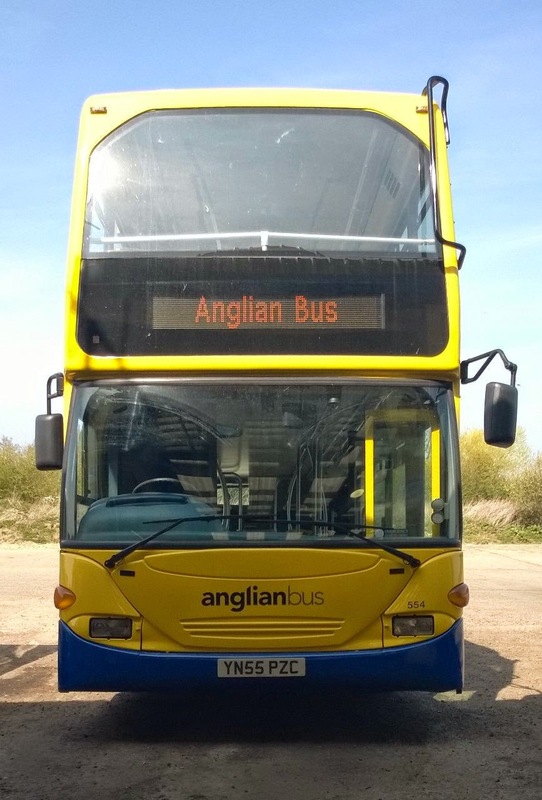 There will be a couple of special posts over the next few days commemorating the end of some long established Anglian routes and/or route numbers and of course next week I'll be reporting on the new ones. UPDATE: I have been informed that 712 has gone to Hedingham's Clacton depot, whereas 722 and 725 will be at Tollesbury to replace a couple of Olympians. 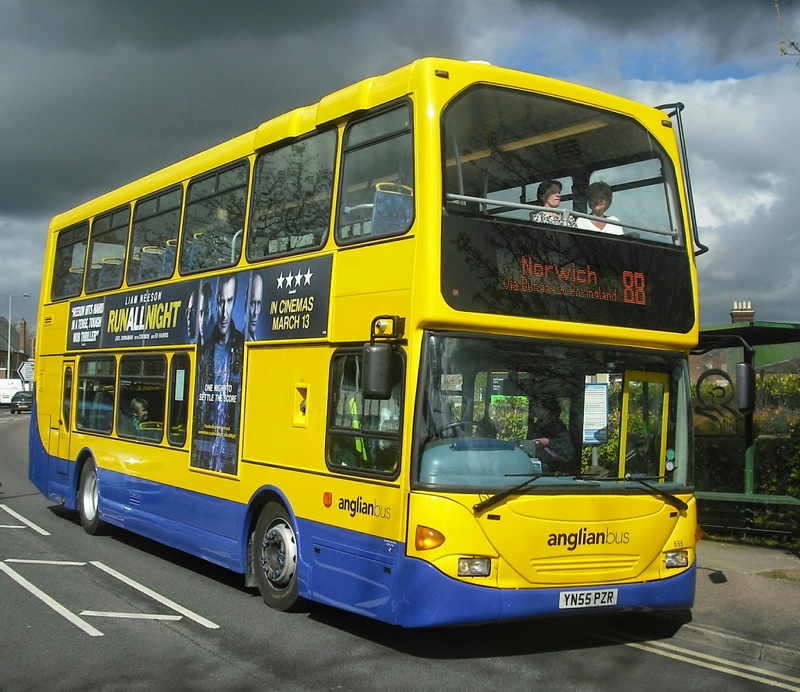 Anglian 712 in Beccles last week, now a Hedingham vehicle. I have also had an update on Gas Bus 104, which was involved in an RTA with an Ambassadoe National Express Levante on the Acle Straight a few weeks ago.Unfortunately the news isn't very positive, and although not officially confirmed yet it looks unlikely that 104 will be seen back in service. If that situation changes I will of course report it. 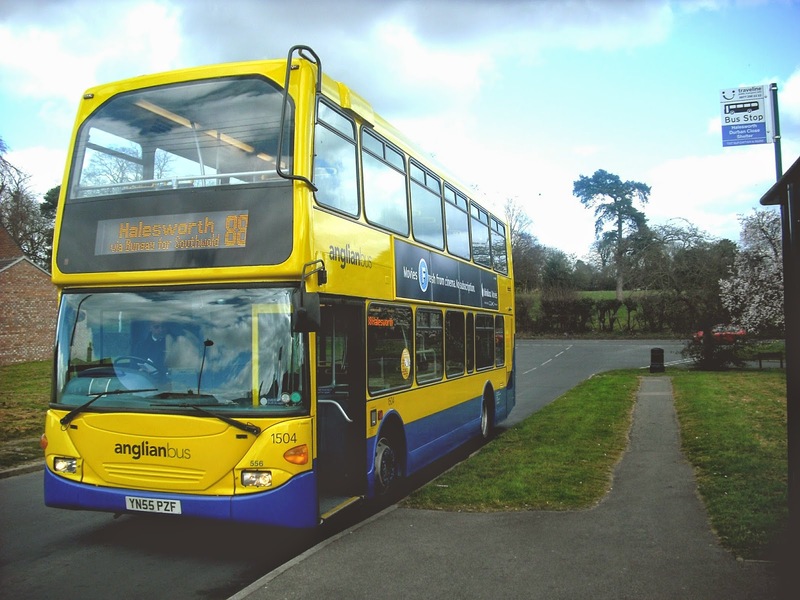 Before I go I need a bit of help with one of the features I'm doing, so if anyone has pics of buses operating Anglian's old 602 between Yarmouth and Halesworth, or the 62 between Kessingland and Halesworth I'd be really grateful if I could use them. Send them to me at the email address on left hand side and obviously full credit will be given. Many thanks in advance. 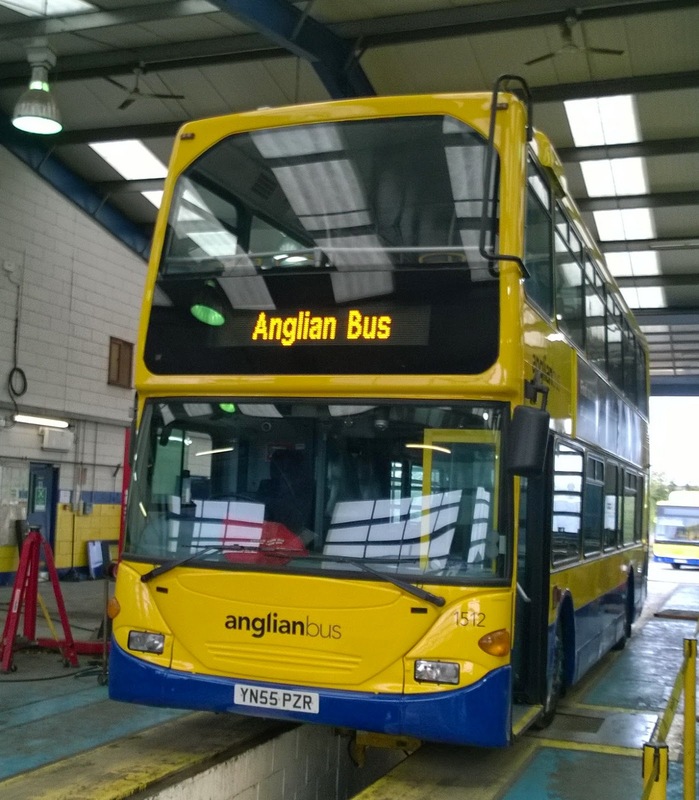 Today saw the first day in service of Anglian's latest Metrobus reject sorry refurbished transfer Scania 554 YN55 PZC. Despite being transferred up for the 88 it was out on the 61/7 today. I caught it from Norwich to Yarmouth, the ride is good and apart from a horrible vibration from the destination display access door when stationary it rattles less than 556 does. However for the entire length of the journey there was a constant bleeping noise which was extremely irritating and clearly shouldn't have been there. So let's see how long 554 lasts compared to 556. Sorry for the lack of posts in recent days. Hopefully normal post frequency will resume soon and to those who have sent in contributionsany thanks and they'll be up in due course. I am grateful to Mick Capon, our man in North Carolina for writing today's foreign post, where he compares the different ways of getting from his home in North Carolina to Washington DC. Many thanks, Mick, and keep them coming! The nation’s capital. Washington DC, is a favorite destination of mine. I usually travel by car (I know – shame on me), but that can be tiring and if, like in all big cities, you happen to hit the outskirts at the wrong time it can be frustrating. There are several alternatives to the car from Durham NC to DC. The car aside, the most obvious to Americans, is flying. Durham is lucky enough to have an international airport, Raleigh-Durham International (RDU), situated between the two cities. 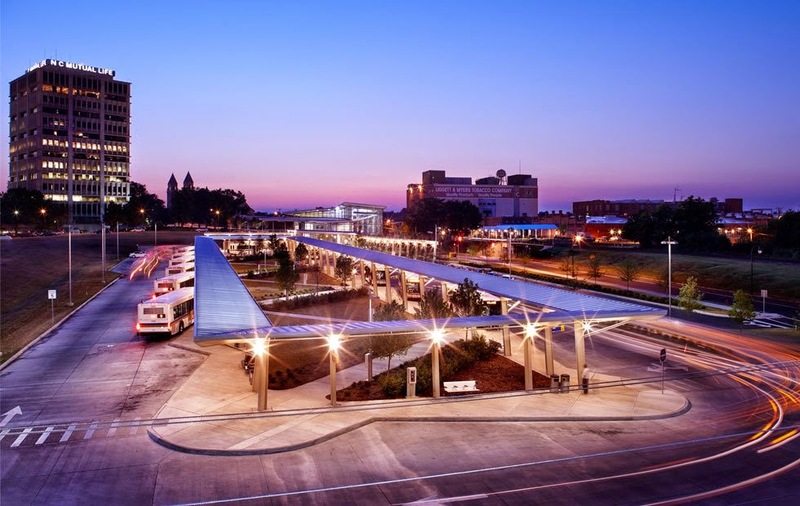 Based on leaving Durham Station, the transit exchange in downtown Durham and Union Station in DC, here follows comparisons for the 259 mile trip. There are 13 non-stop flights daily between RDU and either Dulles or Ronald Regan airports. Flight time is approximately 1 hour 15 minutes, but of course, flying is not as simple as that. Travel to RDU via Go Triangle adds another 43 minutes, security and checking in another hour and the transfer from Ronald Regan in DC 21 minutes via Metro, from Dulles an extra 65 minutes. That’s a total travel time of 3 hours 19 minutes. Lowest cost for flight and transfers is c. $98, but like all air fare can vary. The average is around $150. Sponsored by the Station of North Carolina, the once daily 7-car Carolinian, hauled by a GE Genesis P42DC, travels from Charlotte NC to New York NV via Durham and Washington DC. That journey time can be over 13 hrs, but the Durham-DC time is 6 hours 47 minutes and costs are $54-$61. Yes the journey is slow, relaxing if you have the time. The route between Charlotte and Raleigh is now owned by the state, known as the North Carolina Railroad (which in total owns 317 miles of track) with rights leased to Norfolk Southern to provide freight service. The northbound Carolinian leaving Durham Station on it’s way to DC and New York. Photo Mick Capon. 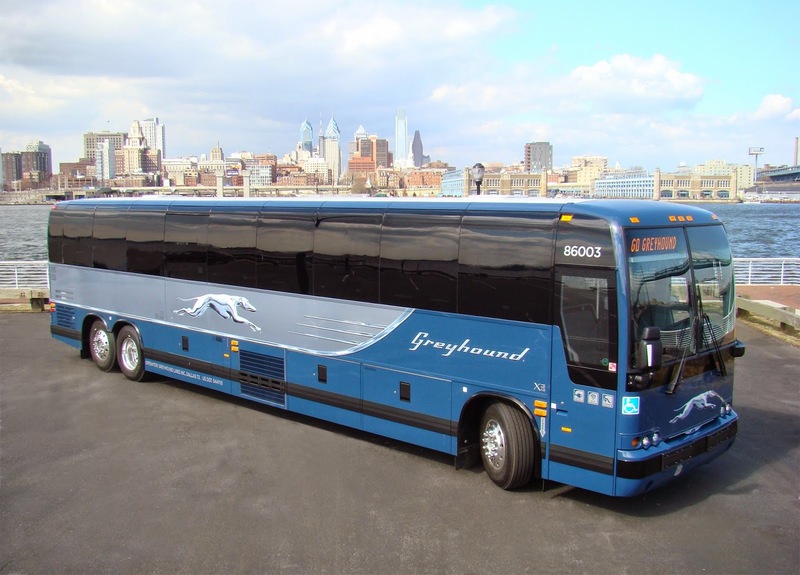 Unlike newcomers Megabus, the iconic Greyhound brand has been operating since 1914. The rapidly expanding Stagecoach owned company, introduced in 2006, is a huge success and by far the cheapest way to travel inter-city in North America. 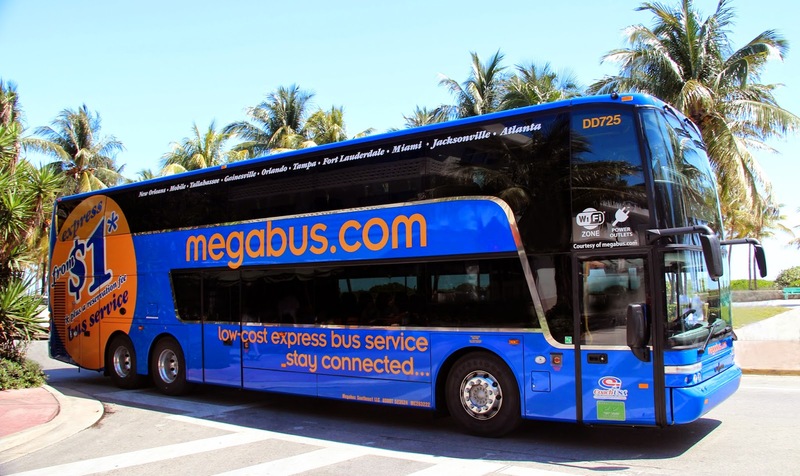 Megabus services are operated by Stagecoach owned Coach USA. Both operate 4 non-stop journeys between Durham and DC daily. 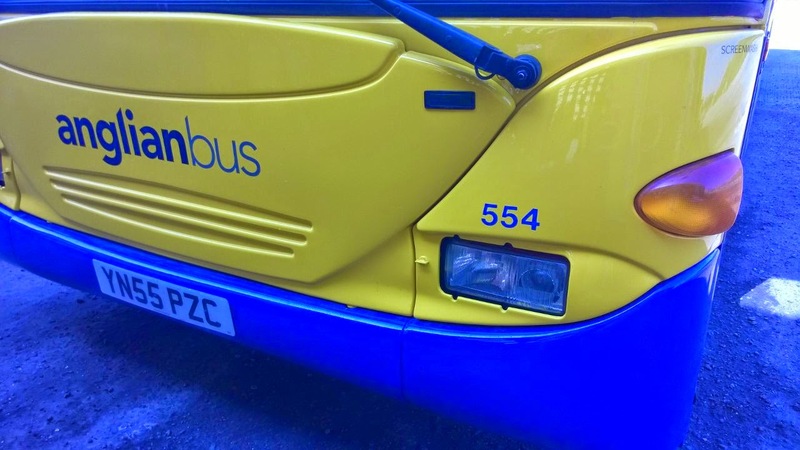 Megabus fares are around the $10-15 range and the fastest journey time is 4 hrs 50, the longest being 5 hrs 15. Vehicles used will be familiar to UK readers, the route being in the sole control of Van Hool Astromega TD925 81-seat double deckers. Megabus DD725, a Van Hool Astromega of 2013. Photo by Megabus.com. No double-decks for Greyhound though but vehicles are a far cry from the Scenic Cruises of the 50s, Canadian built Prevosts and MCI (Motor Coach Industries) being used. Nothing lightweight about these beauties, but they are comfortable vehicles. 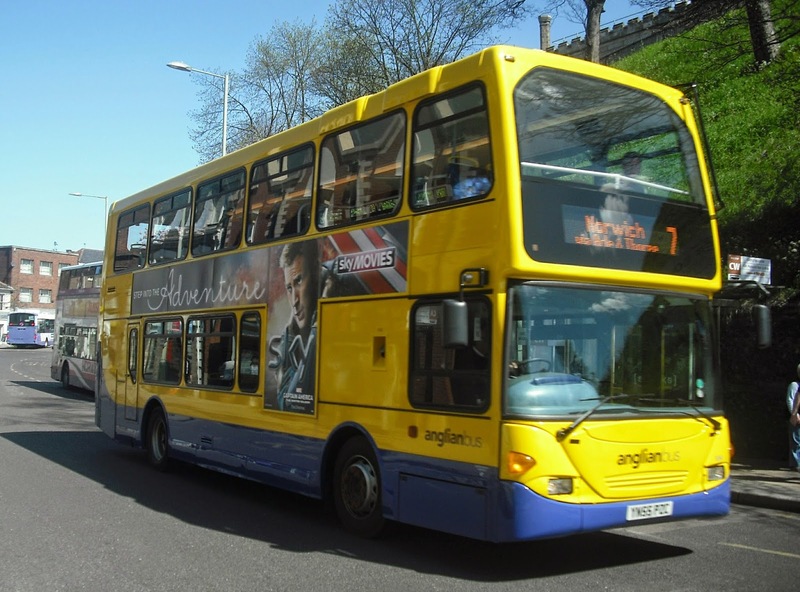 Greyhound fares are more expensive between $28 and $37 depending on the time of travel, whilst journey times are somewhat slower, due to many more stops than the Megabus route, at between 7 hrs 15 and 8 hrs 35. Notwithstanding the hassle of driving and the obvious annual running costs, the trip by car is reasonably cheap and easy. I would expect to pay $19 for gas (petrol) and, depending on the time of day, make the trip in about 4 to 5 hrs. Within a couple of miles of my home I hit Interstate 85, switch to cruise control, then the I-95, the same route as Megabus but without the diversion into Richmond VA. In conclusion, it can be seen that the Megabus option is attractive to many. Finally a photograph of Durham Station. Opened in 2008. It serves all local, inter-city bus services and Amtrak. The Railroad station can be seen center right. First of all My thanks to Arthur the Anglian Aardvark who got in touch very quickly today to tell me of the arrial of Anglian's latest ex metrobus Scania Omnidekka. 554, registration YN55 PZC arrived at Ellough Rd today, although as yet it isn't known when she will enter service. Let's hope she lasts a bit longer than 556 did, which is still at Hants & Dorset. I can also tonight bring you news about the three Tridents, that I was told only last week would be going to Hedingham "eventually". It turns out "eventually" means "almost immediately" as 722 is going down on Monday, 725 on Wednesday and 712 next Friday. That is all, of course subject to last minute changes of plan. So this picture I took today of 722 very unusually on the 7 could well be the last taken of her in active service at Anglian. Actually you have two rarities in one in this pic, as a Konect Optare Tempo - 405 if I remember correctly - is operating the 604 and not the usual bendibus. 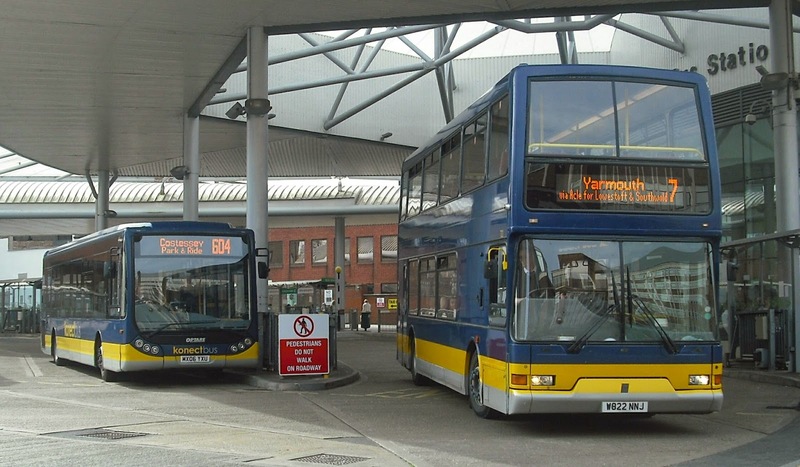 Anglian 722 and Konect 405 both on unusual routes today at Norwich Bus Station. 722 is off to Hedingham. Yesterday I had to get to Wickham Market early for a funeral, and I ended up getting there early enough to see the school contract buses for the firat time in a long time. Parked in Wickham Market Square was this Norse E300. While checking with the driver that it was ok to take a pic, I had a quick glance inside and they really are sardine cans, with leg room that is pathetically restrictive. OK for Primary school age kids going to swimming lessons but older Secondary school students are adult size and there's no way I could have sat in one of those seats AND worn a seatbelt when I was 12 let alone now. Not impressed. Anyway thanks to the driver for letting take this pic. I'm pleased to say my plea for more foreign material was answered, and today I bring you the first part of an Estonia/Finland special, with pictures supplied by David Squire, Managing Director of First Eastern Counties. Great to have you on board, David, and thanks for sharing your pics with us. I'll quote a section from David's accompaning email; Please note all pics remain copyright to David. As promised here is the first instalment of my travels. To kick off we are in Tallinn, Estonia, the Baltic State immediately opposite Helsinki in Finland of which more in the next mail, it is May 2013. 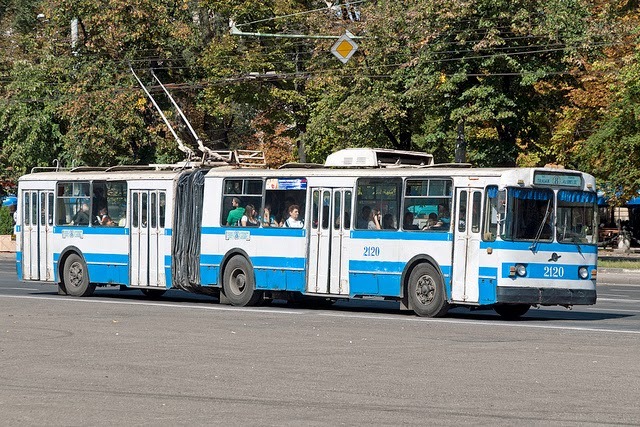 As a former soviet state, the fleet has a number of aging vehicles, surprisingly the municipally owned operator in Tallinn, the major city and capital operates buses, trams and trolleybuses. Trams are painted in various liveries whilst buses are green and trolleys blue although there are numerous allover adverts. Below we have a tram, a modern low floor trolley and a superb older articulated trolley of which there were still a significant number in service! The modern trolleybus - anyone know the make? And the older trolleybus, again with big wheels! Not sure I can see a pantograph on the next one so it must be a bus. Over to you wonderful people to identify it please as my knowledge of all things Estonian is approximately zero! More to come tomorrow, when we also pop over the border to Finland, where we find a beer tram??? Not to be missed! 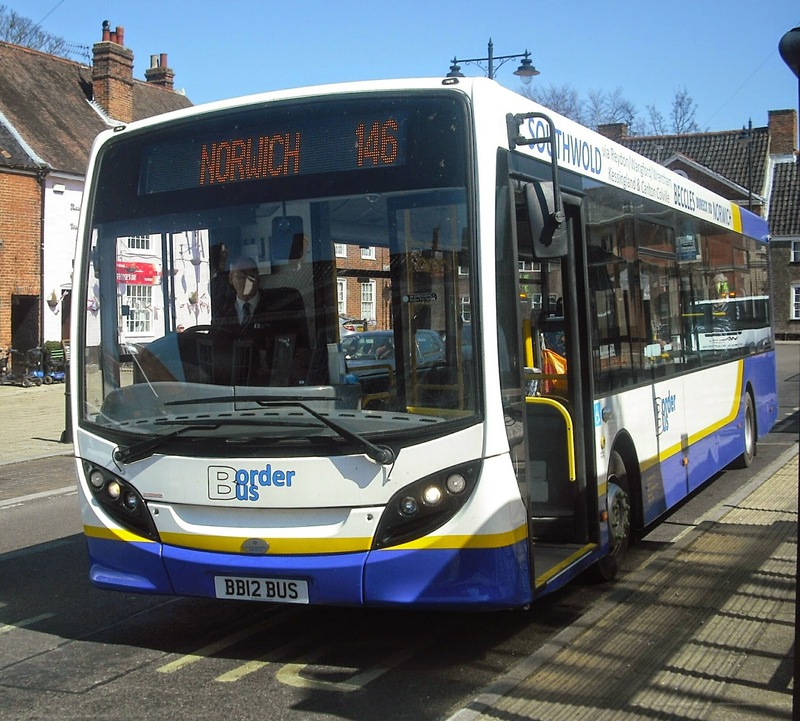 On Tuesday I posted pictures taken at the Norwich end of my Short Set journey on Monday, which could be my last oe on the 47's before they are replaced by 37's in May. (see here). In Part Two here is the report from Yarmouth, and the pics taken there. I'll never get tired of taking pics of these wonderful old locos in sun like this, and I hope you won't get tired of seeing them. At the other end of the set was 47 818, my persnal favourite but my word she was smoking well on Monday and smelling like a ship's engine room! I've no doubt the 37's will look just as impressive, but I'm going to miss the 47's. A charismatic, temperamental, loco that has served the public so well over the last half a century. I hope they stick around on other duties for many years to come. Can't think of many better sights than that. This is one of the more predictable posts of the year - when BorderBus got their new E200 it was fairly obvious it would soon get a cherished registration. Even more obvious when last week I was in Dave Marshall's office listening to him order the number plates! I kept quiet though and waited for the official launch, which came today with the new BB12 BUS making her new registration debut on the 146. By chance I was on my way from a funeral in Wickham Market to Norwich when I saw the tweet from BorderBus, and on the off chance diverted to Beccles, paying a fortune on the train in the process - no wonder the train was empty! Anyway my gamble paid off when after a quick call to Moor Park I discovered that BB12 would be at Beccles 15 mins after I got there, going to Norwich too. That's just the luck you sometimes need, so camera poised in a cloudless sky I waited for the former MX12 DYU to arrive. Have to say she looks rather good. Having temporarily run out of contributor's pics to publish a morning post with I was thinking what I could use for my morning post today and for some unknown reason Moldova sprung to mind. I have had a lot of view from Moldova in the past - Lord knows why - and thought I'd do a quick search to see what's out there. 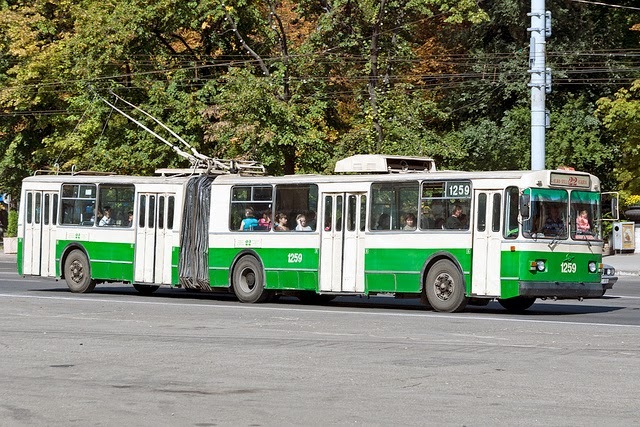 Well it seems Trolleybuses are the order of the day in the capital, Chisinau. There are a lot of them, and having recently featured trams we may as well do trolleybuses too. 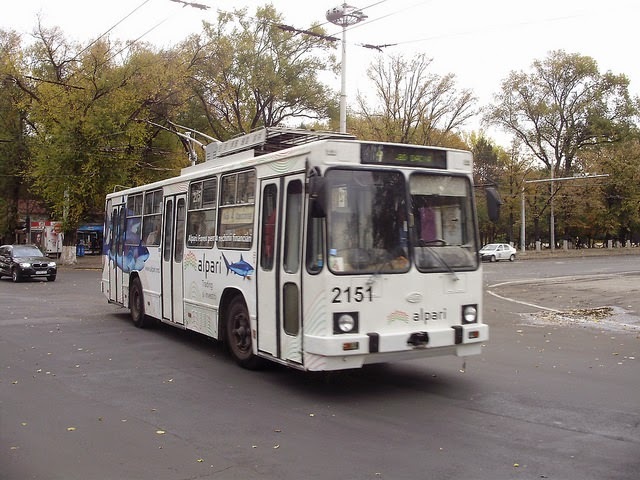 A bit of research (luck in clicking on the right pic) and I managed to find out a little of the vehicles used, but first a pic of the old type of trolleybus that is being phased out of service in Chisinau. This pic is by Clay Gilliland, whose Flickr page you can access here. 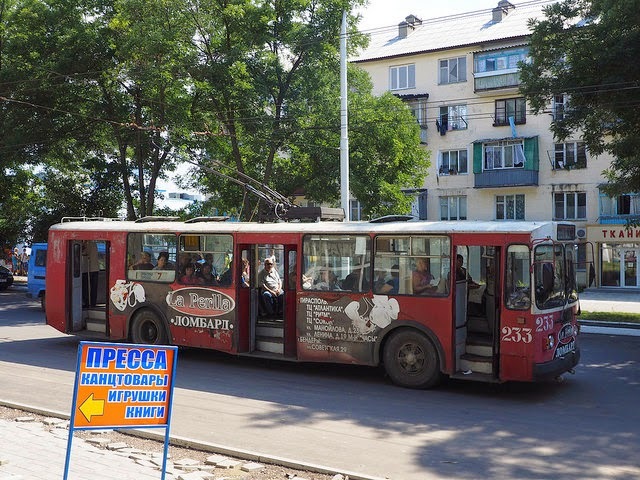 Belkommunmash is Belarusian manufacturer of public electrotransport. The enterprise was founded on basis of the repair tram-trolleybus factory which was opened in 1974. Today it is the leading industrial enterprise in Belarus in the field of manufacture and major overhaul of a rolling stock of city electric transport. Trolley buses of Belkommunmash's manufacture are operated in 7 cities of Belarus and 32 cities of Russia, Mongolia, Moldova, Latvia, Kazakhstan, Kyrgyzstan, Serbia. So let's see a few more examples of Belkommunmash's handiwork. This pic is by mostlybytrain and if you click on the link to his flickr page you'll be in for a surprise! You can access it here. I confess I've never been on a trolleybus outside of East Anglian Transport Museum, so I have absolutely no idea what these are like. Wonder what happens with temporary traffic lights! Here are two examples of the newer trolleybuses, and a couple of things strike me about them - firstly the wheels look huge - bigger than standard bus wheels, and secondly two sets of doors in the rear unit looks a slight overkill to me. Both pics are by Pieter van Marion, whose Flickr page you can access here. No idea where tomorrow morning's post will be from - I'm hoping for some presents in my inbox today to help me out!! It was just going to be a routine day really. I was heading into Norwich to meet up with First Business Manager and night club bouncer Chris Speed for a tour of First's new offices and crew accommodation in Castle Meadow, as well as one of our now regular chinwags. I have to say I was unprepared for the scale of the place - I was under the impression it was basically a restroom and supervisor's office, but no, the whole operation is in the process of relocating from Rouen House. We then adjourned to Chris's new office, at the front of the building overlooking Castle Meadow. I didn't take too many pictures in the new complex, but I did insist on one of Chris's office, which he is sharing with Hugo Forster, First Norfolk's General manager, who wasn't around yesterday. Chris has approved this pic. I'll show the view from out of his window at the end of the post. We nattered for ages but sadly the huge majorty of what we talked about I can't publish! What I can say is the repaint programme at Norwich is set to recommence soon. I saw the list but can't reveal it! Just as well actually as I remember very little of it! One thing I can reveal is regarding 69426/8 in Ipswich. It seems that the original purpose of their painting into Excel hybrid livery may not be happening now, and so they will remain as they are now, looking great in regular service. What I haven't mentioned yet is while I was getting the grand tour we passed the biggest office in the new premises. I was introduced to the gentleman occupying said office and invited back after I'd finished with Chris. I appreciate excellence, regardless of what it is. It could be a flawless piece of driving, a Beethoven Symphony played to perfection, a steak cooked exactly right etc. However excellence doesn't always equal enthusiasm. Enthusiasm is what I felt when I was sitting in the office of First Eastern Counties Managing Director, David Squire. I was completey unprepared for this meeting, and had absolutely no questions prepared. However I needn't have worried. I'm not sure how long I was talking to David - around an hour I think, and the subject of First took up I'd say around 5 minutes of that hour. The rest of the time we were talking buses not business. We compared experiences both as passengers and drivers. David grew up in the Merseyside area, and worked for many years for Crosville. indeed he told me about a make of bus I'd never heard of which he regards as the most lethal bus ever built! I'm currently researching it for a post soon. David revealed he is a regular reader of the blog and in particular said how much he enjoyed the recently introduced foreign features. I'm delighted to say that he has accepted my invitation to become a contributor, as he travels extensively and has a large collection of photos from other countries he is willing to share. I am grateful to anyone who contributes to the blog, but to have a contributor so far up the industry ladder is an endorsement I'm rather proud of. When we weren't talking about Leyland Atlanteans or how we could get away with things 30 years ago that you'd get dragged into Court for these days, I sensed the drive and passion that David has for First. He described it as still very much a work in progress, but the progress so far has been good and wide ranging. The whole team seem very proud of Ipswich and the transformation there, and are now concentrating on the rest of the region, in particular Norwich. The change in policy to involve enthusiasts and bloggers, realising the valuable information and feedback they can provide starts at the very top, and it was made clear the wish is for that policy to filter through to all staff. Obviously that is a policy I cannot praise highly enough. First have clearly realised that if you look after your staff they will look after you. The new crew accommodation is of a high standard, and the fact that managers are more accessible to deal with any issues will help relations too. First offer good pay and now they offer good conditions for Norwich drivers too. Other operators may have to take note and act if they wish to hang on to their best drivers. I started this blog 18 months ago yesterday. David Squire became MD of First Eastern Counties 20 months ago. When I first started I had many criticisms and scant praise for First. Now the opposite applies, and I have a feeling over the next year we will notice improvement on improvement. If there is enthusiasm and love for the job and the industry at the top, then the rest of the staff will notice and respond accordingly. I was describing an operator to someone the other day by saying the love had gone from it - people came in and did their job but there was no passion at the top. Since David Squire appointed his team, including Chris Speed, the whole atmosphere at First has changed, attitudes have changed, and the results are beginning to show. There is an air of enthusiasm and determination about the place, and I'm looking forward to reporting developments as and when they happen. It's going to be an exciting year. Thank you for your time, David, it was a really unexpected pleasure. I said I'd finish with the view from Chris Speed's new office window and here it is. I guess there are worse views if you're a bus manager! Hands up if you're jealous! 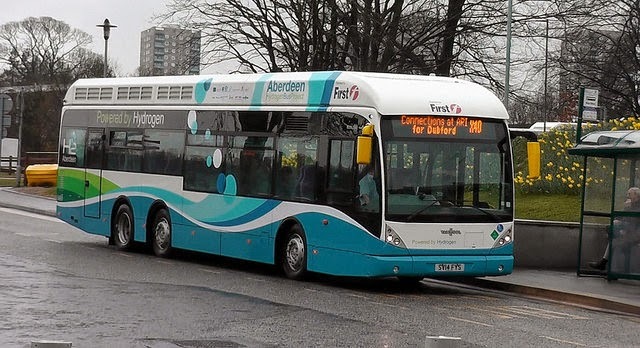 Here is one of the giant Van Hool hydrogen buses running around Aberdeen in a joint venture between First, Stagecoach and Aberdeen City Council. I am determined to get on one of these this year somehow, might be another mega Megabus trip! This pic was taken on March 26th by Prisma Aberdeen whose Flickr page you can access here. Welcome to Part Two of what I believe will be the introductory feature by former Norfolkian Mick Capon of the bus scene in North Carolina. If you missed Part One then click here because you'll need to read the description of the area and how the transit system works that Mick supplied. In Part One I said that the Gillig buses looked rather Dart like. Mick assures me this is not the case and that the Gilligs, and indeed all US buses are extremely solidly built - like the proverbial outhouses! So let's look at more examples of what's running around in Mick's back yard! First up is a Go Raleigh (the three districts are Durham, Raleigh and Chapel Hill) Gillig Advantage in the new livery only recently introduced. 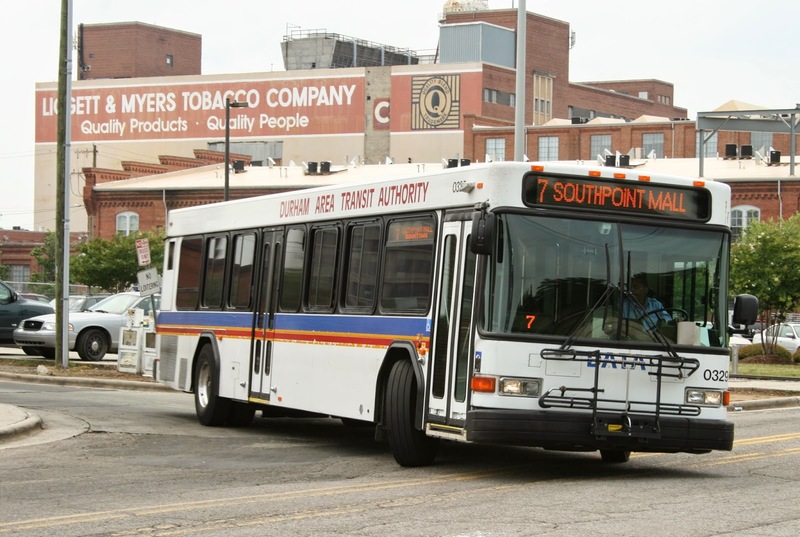 Next we have a Triangle Transit Gillig Advantage in a revised livery that clearly wasn't that popular as it's now obsolete. Can't say I like it that much either! So this is what replaced it. Here is a Go Triangle Gillig Advantage in the new livcry. One thing Mick told me is that buses in the US come with alloy wheels as standard, which are obviously easier to keep clean, if more expensive. Bet you'd find them easier for your brooms, Paulo! 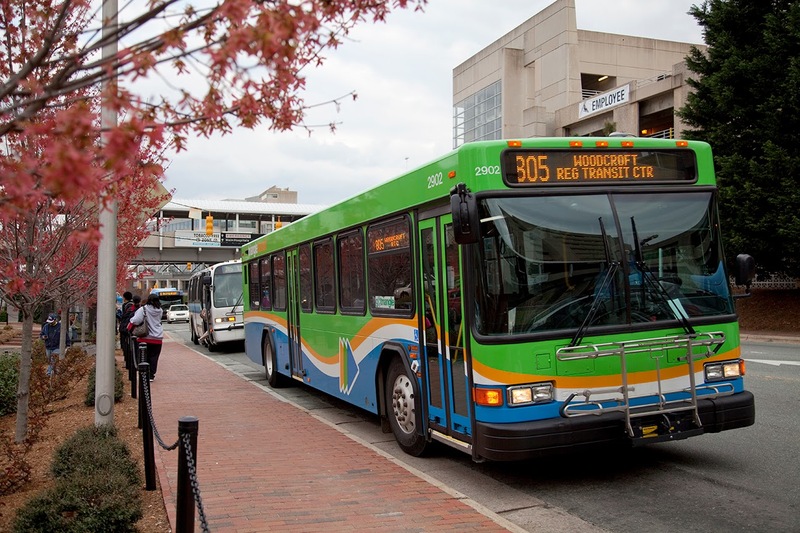 Go Triangle's Gillig Advantage with very shiny wheels! On May 10th the new Summer timetable comes into effect on Greater Anglia. From the same date, well on Monday the 11th obviously, 2 Class 37/4's are scheduled to replace the Class 47's on the Short Set which operates between Norwich and Yarmouth/Lowestoft when there aren't enough DMU's available. As I saw the set was out today I decided to get on the 47's for what could be the last time on a train operating a timetabled service on the national network. I arrived at Norwich in plenty of time fo the 1236 departure to Great Yarmouth, and took advantage of that time to get some pics for the scrapbook. I was a little disappointed to see that 47 790 had been taken off the set and replaced with 47 805, but never mind - a 47 is a 47 and the noise 805 made was music to my ears. It must be said that Emily was smelling like a ship's engine room and smoked like a chimney on the way back! Far less smell and smoke from 805. It was also my first journey on the DRS MkII coaching stock. Comfortable, smooth and could hear the engine which I wanted to! A great journey, and I'll have the pics from the other end at Yarmouth in another post. DRS MkII coach - sorry can't see number! 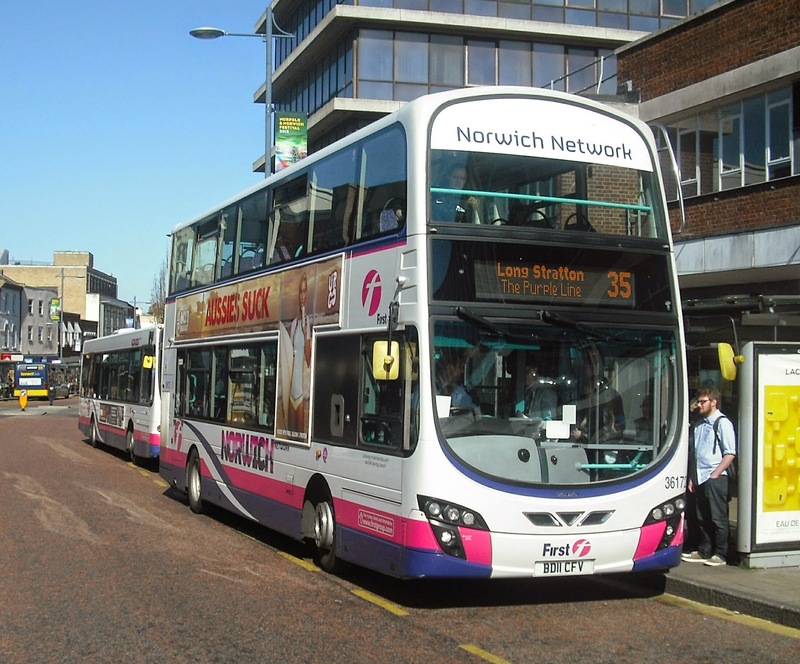 Last week in Norwich I saw one of the Gemini 2 Volvo B9's normally on the 25/26 on the 35 to Long Stratton. unfortunately i was all fingers and thumbs and by time i got cameras and memory cards sorted I didn't get the chance to take a picture. However, the same thing happened yesterday, which makes me think this might be a regular PM working, and this time I had the camera primed and ready to fire. Welcome to the first post on SB&TP to come from the good ole US of A. Former Norfolkian Mick Capon has been in touch with details of the bus scene in his North Carolina home. Save me trying to explain it all Mick has very kindly sent me a full explanation, which he has given his consent for me to reproduce. Thanks, Mick. Since making my home in Durham, North Carolina nine years ago, I have continued my lifelong interest in buses. Bus operation in the USA is possibly not well known among most British enthusiasts, apart from the long-distance operations of Greyhound, Trailways and now Megabus, and perhaps the obvious interest of former British open-top ‘deckers operated here in a tourist capacity. To explain the geography, The Triangle is a metropolitan area in the Piedmont of North Carolina, USA. It consists of three main cities, Raleigh, Wake County (the State Capital); Durham, Durham County; and Chapel Hill, Orange County. The combined population is approximately 1.5 million. The average student population of each city is 32,000. Each municipality has its own transit service. They are linked by the inter-urban services of the Triangle Transit Authority. All vehicles are dual-door, single-deck and have front bicycle racks. A fixed fare system is the norm, in Durham it’s $1 (seniors free) although in Chapel Hill all rides are free. Distances within towns are, in comparison to East Anglia, huge. For example, if my wife suddenly decides she needs knitting yarn she would think nothing of nipping out on a 25-mile round trip to the craft store across town. The bus scene here is boring, but for all the right reasons. Services are regular, very cheap, regular (same timetable from early morning to very late every day), geared to the passenger (with six-monthly public consultation meetings). The main manufacturer that the operators in Mick's part of the world seem to use is a Californian company called Gillig, who according to Mick are a favourite with smaller operators. Buses are delivered the same way as the UK, ie driven. However, in North Carolina's case that's a distance from the factory of around 2,500 miles, which I guess gives every chance for any teething troubles to be noticed. To me they look similar to Pointer Darts. Here are a few examples. 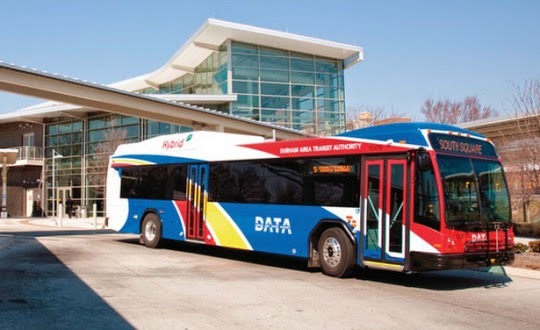 The first pic is a Durham Area Transit Authority (DATA) Gillig Advantage. Here a Gillig Hybrid, in a refreshed DATA livery introduced in 2010. Finally for this part a CAT, which stands for Capital Area Transit. 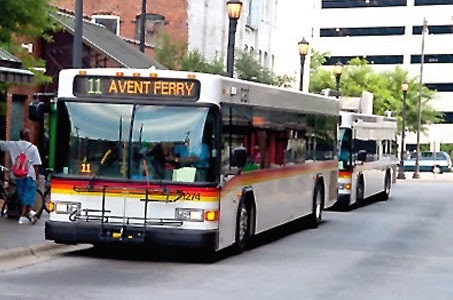 Yet another Gillig Advantage, this time back in the old livery. My thanks to Mick for the pics, look out for part two coming soon. Mick has promised me a ream of pics on different aspects of US bus travel so the American Slot could become a regular feature. many thanks Mick - you can't keep an d Norfolk boy down! Are Car Drivers More Important? And You Thought Your Bus Route Was Tough?